Minutes after the final whistle blew in the All-Ireland final on Sunday – the game was over long before then by the way – a member of the Kilkenny team handed Henry Shefflin a fresh jersey to wear. It wasn’t that the great man smelt or anything, or even that he had swapped his jersey with the poor unfortunate Galway defender who had spent the afternoon chasing after him in Croke Park. And there was nothing whatsoever wrong with the number 11 shirt already on Shefflin’s back, a shirt he has called his own for over 12 years now in the Kilkenny colors. 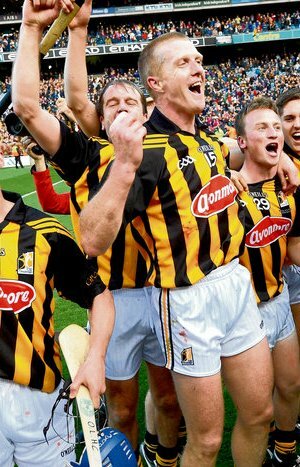 No, the reason Kilkenny’s mentors and fans and the many photographers standing in front of him as he held the MacCarthy Cup aloft wanted to see Shefflin in another shirt was down to the new number on his chest – the number nine. Henry Shefflin didn’t just win the All-Ireland final for the Cats and with the Cats on Sunday. He also confirmed his standing as the greatest hurler ever. It’s true to say that those of us of the color television era have no way of knowing how good Shefflin is next to Mick Mackey or Christy Ring or John Doyle or even the more recent hero Eddie Keher. We weren’t around in their particular heyday and, Keher aside, there isn’t really enough video footage of those greats to allow comparison with modern day legend Shefflin. What’s now indisputable is that Shefflin has won more All-Irelands as a starter on a September Sunday than any other hurler in the history of the great game. Noel Hickey, who won his ninth MacCarthy Cup as a playing sub on Sunday, and the great Kilkenny ‘keeper Noel Skehan have the same number of Celtic Cross medals as Shefflin, but they didn’t start every All-Ireland final they won. Nor have they come back from as many career threatening injuries as Sheff. Twice in the recent past he has battled his way back from cruciate knee injuries that would have finished a lesser player. More recently he has overcome a shoulder problem that he himself thought would keep him out of the real action this summer. Now that he has more medals from the field of play than any other hurler, there can be no doubting his greatness. And just in case anyone wonders about his current ability, study the video of last Sunday’s thoroughly deserved win for the Cats. Shefflin, fittingly in the circumstances, scored nine of the 22 points Kilkenny notched on their way to a 3-22 to 3-11 win over Galway that was never in any doubt. He also controlled the tempo of the Kilkenny attack from start to finish and ensured the pressure of expectation was kept away from youngster Walter Wash in the full-forward line on his senior debut. Shefflin was, in essence, the man as far as this All-Ireland final and this Kilkenny team was concerned. That’s been the way for many years now and it promises to be the way again in 2013. Not long after that temporary number nine jersey had been put away on Sunday evening, Henry Shefflin vowed to have a go at stretching that record run of medals next summer. They had better start work on a number 10 shirt with King Henry’s name on it now!